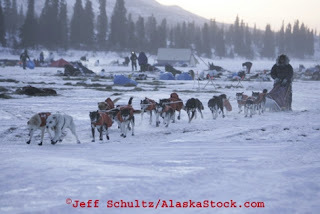 The Iditarod is a 1,150 mile dog sled race beginning in Anchorage, Alaska and ending in Nome, Alaska. A musher and his sled is pulled by a team of about 15 dogs. The race which began last weekend continues with many of them at what appears about half way. The race originated from the serum(medicine) run in 1925 when Nome had an outbreak of diphtheria and the only way to get the needed medicine was by dogsled. At that time it was a relay team of dog sleds. (Remember the story of Balto?) 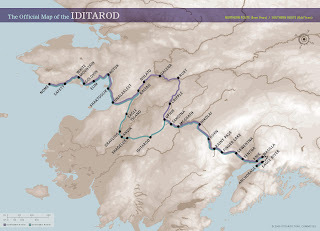 The Iditarod is raced every year with the southern route this year being an odd year. You can see the standings and a lot of other interesting facts(such as the location of each musher, the number of dogs he still has racing, video clips, the weather conditions, map including an elevation map) at www.iditarod.com One of the reasons that the Iditarod is interesting to me is that my Dad's high school friend, Jon Korta, is racing in it this year. He is bib #24. This morning his standing is 36 out of about 66 remaining racers. It seems he is doing well considering it's his first year. They are required to take one 24 hour rest period and it appears he is doing just that. Geoguy's aunt and cousins live in Alaska, and they sent a book about a boy who raced too! Thanks!